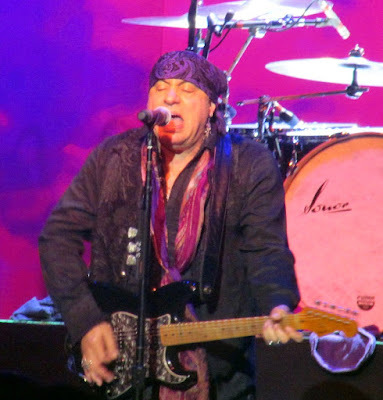 Though I've long been a fan, it's hard to say for exactly what Steven Van Zandt--a.k.a. Little Steven or going back even further, Miami Steve--is best-known. He's a long-standing guitarist in Bruce Springsteen's E Street Band, was an instrumental producer and/or arranger on some of the Boss' best songs & albums and is possibly Springsteen's closest friend. He co-starred as Silvio Dante on The Sopranos, one the most acclaimed TV shows ever, and led a Netflix series of his own, Lilyhammer. In the mid-'80s, he wrote "Sun City" to protest the apartheid regime in South Africa and led the Artists Against Apartheid recording of it, the accompanying video and activist movement that I perceive as having great effect. With Little Steven's Underground Garage radio program and subsequent channel on SiriusXM, he has become a radio mogul, he runs his own Wicked Cool record label (I love the album Pictures by the Len Price 3) and is an avid and quite active champion for the multifaceted importance of rock 'n roll. Toward this end, he has spearheaded the Rock and Roll Forever Foundation and the TeachRock initiative, which creates K-12 national curriculum. He's notably worked with other musical artists--particularly Southside Johnny & the Asbury Jukes--helped get the Rascals to reunite & tour as a theatrical presentation and has written numerous songs for himself (including the strident "I Am a Patriot," covered by Jackson Browne and Pearl Jam, among others). 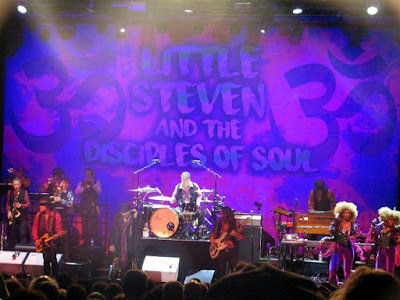 And when time and opportunity allow, Little Steven is a bandleader, frontman and singer who tours with the Disciples of Soul. Monday night, SVZ and 13 Disciples thoroughly rocked Chicago's grand Copernicus Center, which houses the auditorium of the old Gateway movie theater. You can learn much more through TeachRock.org, but the initiative seems to comprise a vast collection of lesson plans aimed at ensuring the history of popular music is part of the K-12 curriculum at schools across the country and around the world. 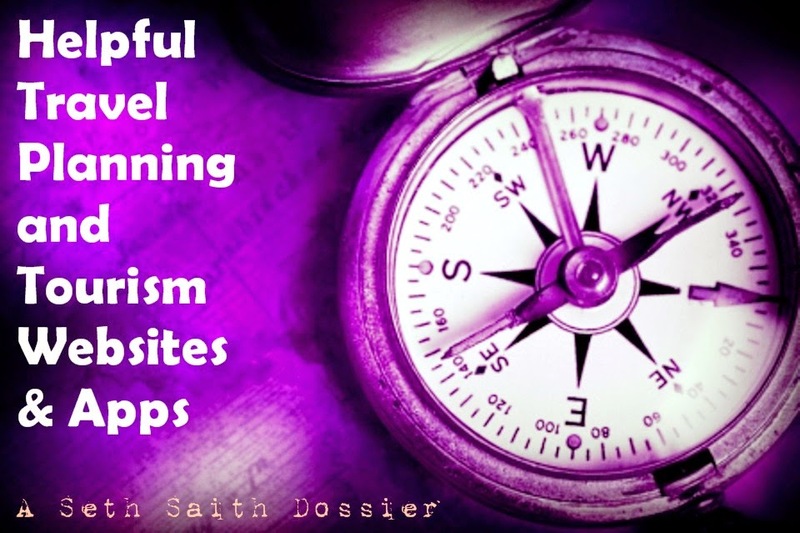 Via this blog and beyond, I have frequently championed--directly and inferentially--the numerous benefits of cultural literacy, and never underestimate the emotional and therapeutic benefit rock 'n roll has had on my life. So while TeachRock seemingly extends far beyond making kids today aware of the importance of the Beatles, I think they merit a place in classrooms every bit as much as Shakespeare, Dickens and trigonometry. And while he and his vast band proceeded to put on a clinic regarding rock 'n roll influences and the art of live performance, it was by no means didactic. This wasn't a lecture, it was a 2-1/2-hour concert that rocked hard. Virtually all of the Soulfire album was represented, with 11 of its 12 songs comprising nearly half those played on Monday, but even these tunes represented a rather robust mix. 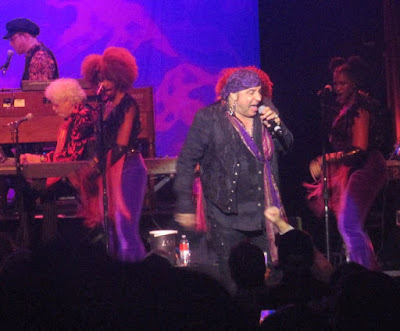 Van Zandt had his hand in writing most of the songs, either solo or in collaboration, but has spread them around long before recording his own versions. "Some Things Just Don't Change," "Love on the Wrong Side of Town" (written with Springsteen) and "I Don't Want to Go Home" were all recorded by Southside Johnny--whose nickname, Stevie shared, derived from Chicago's South Side--while "Standing in the Line of Fire" was a shelved tune initially intended for Gary "U.S." Bonds that also pays homage to Spaghetti Western composer Ennio Morricone. "Ride the Night Away" is a song Van Zandt co-wrote with Steve Jordan that Australian rocker Jimmy Barnes recorded in 1985. I'm only familiar with Barnes due to his guest appearance on a Springsteen tour of Australia in 2013 (which SVZ incidentally had to skip due to filming commitments). A couple of straight covers included "Blues is My Business"--made famous by Etta James--and James Brown's "Down and Out in New York City," with an extended horn jam that reminded me of Springsteen's live versions of "Kitty's Back." As of this writing, a setlist for Little Steven & the Disciples of Soul at Copernicus Center in Chicago doesn't appear to be posted to Setlist.fm, but I think what was played matches this Green Bay setlist, except that we got a cover of Them's "Gloria" as a first encore with Jim Sohns of Chicago's classic Shadows of Knight band. There were many selections I didn't knowingly know or recall, but "Lyin' in a Bed of Fire," "Angel Eyes," "Under the Gun," "I Saw the Light," "Salvation," "Bitter Fruit" and the closing "Out of the Darkness" all packed quite a wallop and proved that while no one will mistake his vocal talents for Freddie Mercury, Little Steven sings pretty darn well for a famous sideman, even as he'll turn 68 this month. And even if his songwriting isn't quite Springsteenian, it's pretty damn boss. 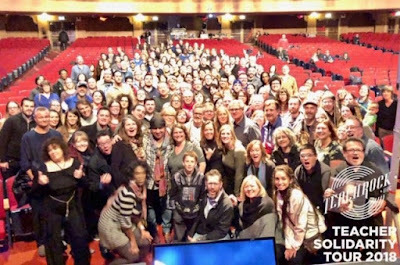 WXRT morning DJ Lin Brehmer introduced Little Steven by aptly calling him "the keeper of the flame," and especially with a $25 ticket in a cool venue, I would have happily applauded just for all his past and off-stage exploits. 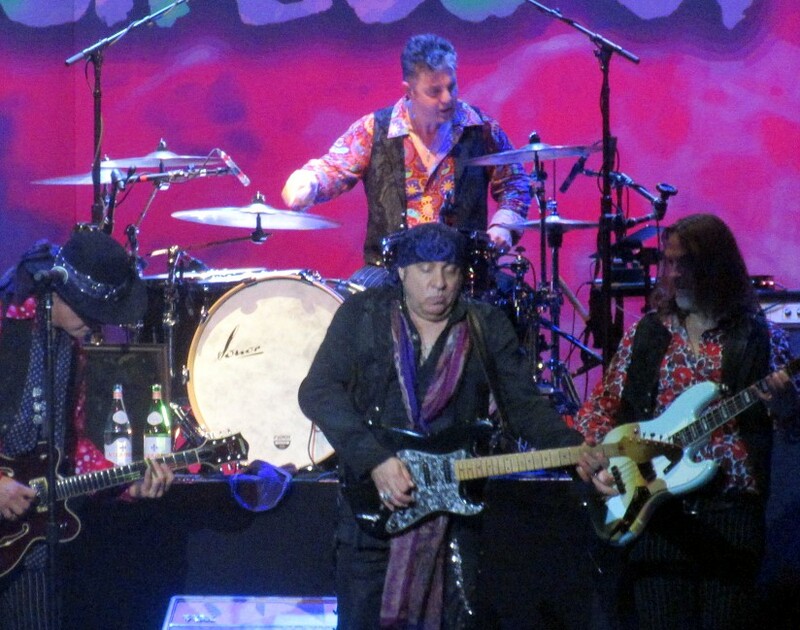 But he and his band--and given all the players, it's hard to imagine SVZ realizing much profit on this tour--delivered 150 minutes of music that was never less than thrilling. This was my 42nd time seeing Little Steven onstage, though my first without him being alongside Springsteen. 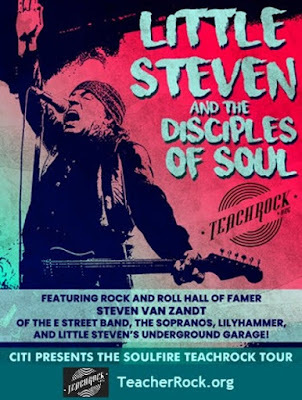 I'm grateful to have had the opportunity, and without needing to compare this show to E Street Band extravaganzas--which are my favorite things ever--I can even better appreciate why & how Steve contributes mightily to Bruce's longstanding greatness. 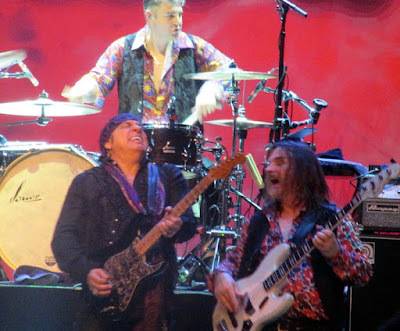 Like Springsteen, Van Zandt not only clearly loves to perform, he understands the tremendous, holistic, soul-replenishing power of rock 'n roll. As a fan, so do I, and rarely has having that lesson reiterated been any more fun.